Supporting kids' natural defense systems is important to promoting their overall health as well as helping to alleviate occasional digestive distress. 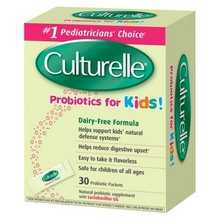 * Culturelle Kids! Chewables support a child's health by fostering the proper balance between good bacteria and the non-benefical bacteria that resides in the gastrointestinal tract.